A beautiful (cold) sunny day and more cleaning of the site. However, a welcome visit from a volunteer digger we hadn’t seen for a while enabled some more of the flint cobbled surface of the path just beyond the front garden gateway to be excavated. Unfortunately, for various reasons, I did not take any photos – so I have used those taken on previous occassions. 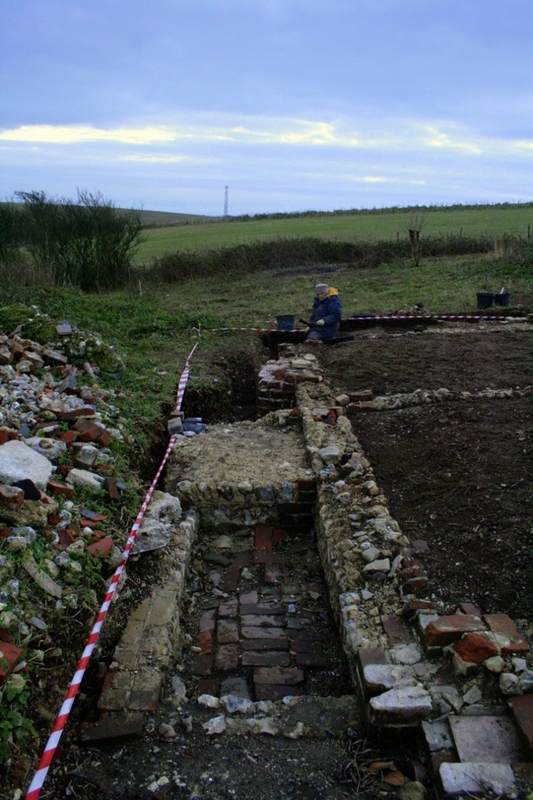 Looking S at cobbled surface N of garden gateway with chalk rubble to right. The cobbles had been very roughly laid, indicating rough repairs. A number of rusty metal, small decorated ceramic shards, some bone, and a few glass finds (one decorated) were found from the demolition fill and the path surface on which it sat. Looking S at ‘shed’ and possible base of a ‘copper’ on E side of cottage. The Newmarket cottage was too far – a mile and a half and a steep climb – from the nearest alternative laundry facilities in the village of Kingston. Also, no memory of any backdoor, no sign of an steps down to the ground surface about half a metre below it. No proof, but a lot of evidence points towards its having been the base of a laundry copper for heating water. Its construction appears to be a form of high quality bungaroosh, such as that of the walls of the cottage. Solid built flint wall faces with strengthening brick quoins at the corners, holding loosely bonded flints. 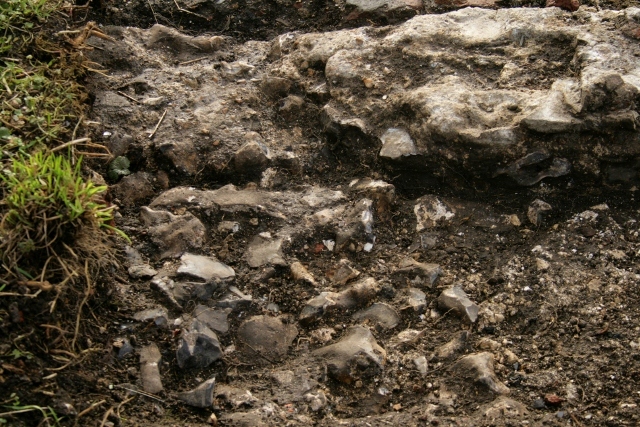 The surviving bulldozer cut top was bonded with a lime mortar concrete, but there are one or two small holes in it through which unbonded, or poorly bonded flints can be seen. Both the wall of the shed and those of the base of the (probable) copper were one brick length wide, half a brick narrower than the cottage walls.